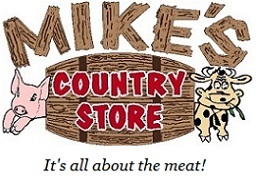 Click the button below to add the Mike's Sweet Bourbon Glaze - 12 fl oz. to your wish list. Mikes Sweet Bourbon Glaze - 12 fl oz. Delicious on pork chops or tenderloins! Ingredients: Dark brown sugar, onions, apple cider, vinegar, soy sauce (water, wheat, soy beans, salt), garlic (contains high fructose corn syrup), bourbon, pepper sauce (vinegar, red pepper, salt), molasses, lemon juice concentrate, modified food starch, natural flavor, glucose delta tactone, less than 1/10 of 1% sodium benzoate added as a preservative.